Fans of the student-produced and university affiliated TV show “CapTV” will be disappointed to learn the class behind it will not be held this semester. When a class fails to make, or in other words doesn’t sign up enough students, it is simply not conducted that semester, meaning that we’ll have to wait a few more months before another season of CapTV can be produced. According to Betsy Pike, director of the Film and Media Production department, the university has a long history of student-produced television programs. CapTV’s precursor was a show called “Skyline Columbus” that was focused on interviews with experts in the Columbus area. The class and the show were renamed to CapTV by students in 2012, shortly after Pike joined the university faculty. “I wanted to broaden [the class], so maybe [students] could talk about food, or movies, or dorm life … I didn’t want them to always have to be out in Columbus,” Pike said. 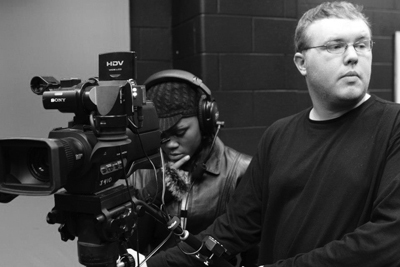 According to Pike, CapTV was unique among the pre-professional classes under the FMP umbrella in that it focused on multi-camera production, a type of cinematography in which more than one camera is used to film at once. This type of production is commonly found on local news broadcasts and in sitcoms filmed in front of a live audience, where creators don’t have the luxury of stopping production in order to get different shots. This unique approach seemed to work in favor of CapTV alumnus and current sophomore film and media production major Geoff Webb, who now has a job in the television news industry. In this program, student have completed numerous projects, including the 48 Hour Film Royale. “CapTV is cheesy, but I was kind of surprised by how much I knew when I got to my job … It’s actually where I found out I wanted to be in the television industry,” Webb said. According to Webb, the class met once a week on Wednesday nights to come up with ideas for shows and then film them. “We usually started the semester with something like ‘Things to Do Around Campus,’ and it would just be like different stories … and then we did a fun game show at some point … so it’s kind of a variety of stuff,” Webb said. Webb has been taking CapTV for his past three semesters, and said that he only took this semester off to work out some kinks in his new work schedule. According to him, a large portion of the students taking CapTV during his tenure had already taken the class previously. According to Webb, the biggest issue with CapTV was a lack of visibility on campus and some persistent technical difficulties with it being aired closed-circuit around the university. “The problem, I think, is that nobody knows about it … it’s never running, it’s always down,” Webb said. What makes CapTV a unique class might also not be what modern film and media production students are interested in. Pike noted that CapTV’s format of 30-minute shows with commercial breaks wasn’t really in line with current student tastes, which tend to lean toward shows without commercials on streaming services or shorter productions like vlogs and webseries on platforms like YouTube. Whatever the reasoning behind why CapTV didn’t make this semester, its absence isn’t being ignored. “It surprised me it didn’t make, but we’ll use it as an opportunity … We’re gonna look at CapTV in the fall and see how we could possibly shake up the structure,” Pike said. The CapTV studio will continue to be utilized throughout the semester for other film and media production courses and independent studies, and will hopefully resume regular use come next fall. For those looking for previous seasons of CapTV to tide you over, episodes of Skyline Columbus or any other student film productions are hosted on captv.org.